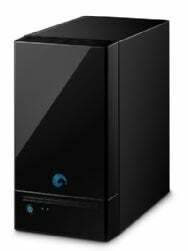 Seagate announced Monday a new Network Attached Storage (NAS) system for small businesses - the BlackArmor NAS 220. The system will be released in July in 2 terabyte (TB) and 4TB configurations for $430 and $700 respectively. The BlackArmor NAS 220 is designed to provide workgroups of up to 20 computers network storage capabilities. It can automatically back up networked computers, features two USB 2.0 ports to connect external drives, printers or an uninterruptible power supply (UPS), and sports user-replaceable hard disk drives. Inside are two hard disk drive mechanism configured together using RAID Level 1 (mirroring). The NAS supports hardware-based encryption and has a single Gigabit Ethernet port. The drive supports Microsoft Windows Server Active Directory for network authentication, and also supports CIFS, NFS, HTTPS and FTP file sharing protocols. It can also be set up to stream media as an iTunes server or a DLNA-compliant media server. Software is included, and it can also be configured using a Web browser. Mac software requirements call for Mac OS X 10.4.11 or later and Safari 3.1 or later.